ARE YOU A MOSQUITO MAGNET ? 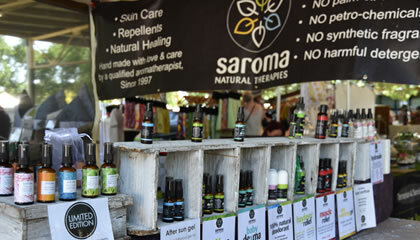 Saroma is the brand behind BuzzBalmô insect bite remedy. Many of you over the years have tried BuzzBalmô to take out the itching, swelling and sting of insect bites & stings. BuzzBalm is the original, natural insect bite remedy in an easy to use tube. Your testimonials about the efficacy of BuzzBalmô are always welcome at the markets. The Saroma range also includes other very popular products such as Deodorants in floral, woody or citrus scents. DeXma gel for dermatitis & eczema, Lavender Cold Sore Lip Balm, Hayfever spray and nasal decongestant. 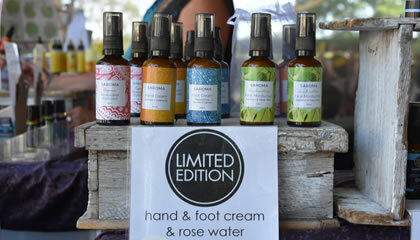 After Sun gel to soothe sunburnt skin and the lovely delicate organic Rosewater to calm your hot flushes! The Spot Vanishing Gel clears pimples, styes and boils has been known to clear many difficult skin conditions such as Molluscum contagiosum, We are also happy to make personalised essential oil blends at our stall. Saroma products are synthetic & petro-chemical free & additive free. All products are hand made with love and care and are made in small batches to preserve their energy, efficacy and freshness. 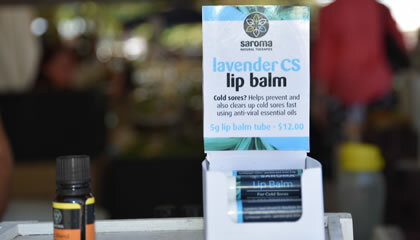 Saroma Aromatics was established in November1996. A range of skin care products were developed by Sara after studying with the Centre for Aromatic Medicine. "Being a trained Aromatherapist lets me create products that really enhance the skin's make up and are exceptional at healing". Understanding the contraindications and dosages of essential oils is important and I bring that understanding to the products we sell, that's why essential oils are an integral part of Saroma. Our customers agree that Saroma products have wonderful healing abilities.